Zimbabwean groups broke up because of that before them. Shona music or Chimurenga, either way seductive stuff. Go dance like crazy with the Four Brothers. This entry was posted in Chimurenga, Shona, Zimbabwe by Moos. Bookmark the permalink. hey, hey, Moos, slow down, too much good albums in a row. Take it easy, take a big breath… Give us a lit bit of time to appreciate each of them. I’m gonna have an auditive breakdown ! Ok, I realise a lack of time to listen to all the great LPs. And I want to listen to all of them! It’s so great what you do. The Four Brothers had some CDs released on Cooking Vinyl 1988/1989. They’re great! Ouch, Yet another killer post! Zimbwe’s greatest ever guitar band (along with Jonah Moyo & Devera Ngwena).You truly are a man on a mission. Don’t stop, even if Arnaud is right! OOOH! 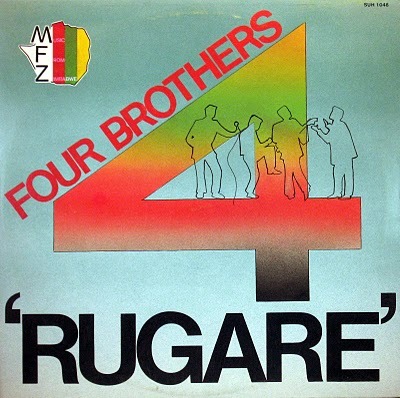 Many many years ago I had one LP from “Four brother”. (Don’t remember how was it calls, but there was a song with name “Kutambura” – we used this word in Russian in means “very very big trouble”. Don’t hear anything about Marchall Munchumumwe since that time. It’s great to meet him again. glad to see all that enthousiasm, and keep them harddiscs spinning guys, there’s yet plenty to come. You know Arnaud, sharing is just as addictive as downloading, I can’t seem to stop..
keep them coming…u r probably the best blogger i tell u man. Excellent album. Thanks for sharing Moos. Apurva from Pune, India. Say thanks to the man!